Geoff’s new wife was an Instagrammer, and he had known it before the wedding, so he should have known what he was getting into. In theory, spending their honeymoon in a winter wonderland had sounded like a very good idea – long cold walks, followed by nice warm sheets. In practice, here he was on frozen beach at dawn while Dahlia capered across the black sands in her red parka and her ridiculously large camera. His nose was cold, his fingers were cold, and his ears were about to fall off. But then, one by one, the magic of the ice diamonds did their work. 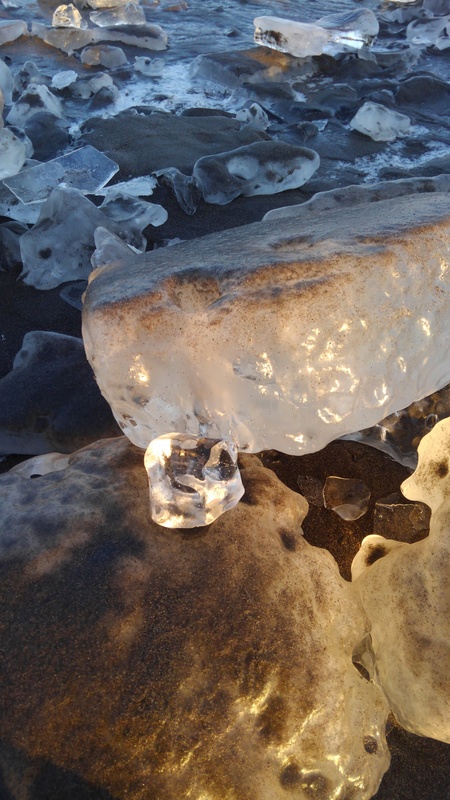 The brochure said they grew slowly in the neighboring river, and that’s what made them so clear and pristine – the kind of ice you’d like to see floating in your whiskey back at the warm bar in the hotel. 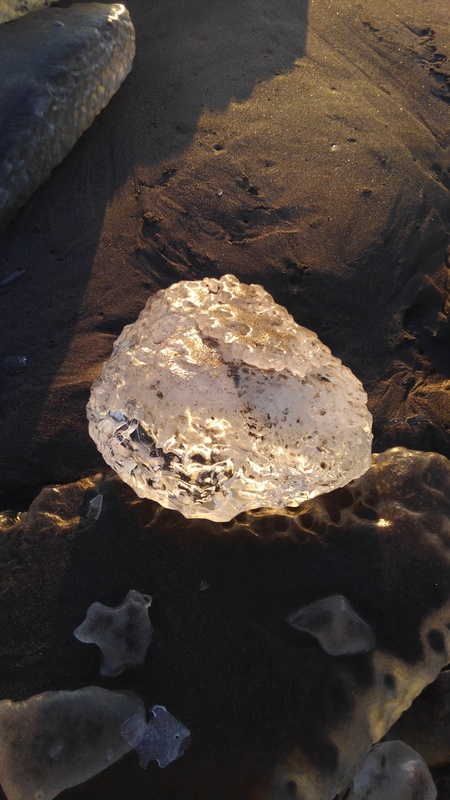 A lot of the ice on the beach was in large slabs, about the size of a spare tire. 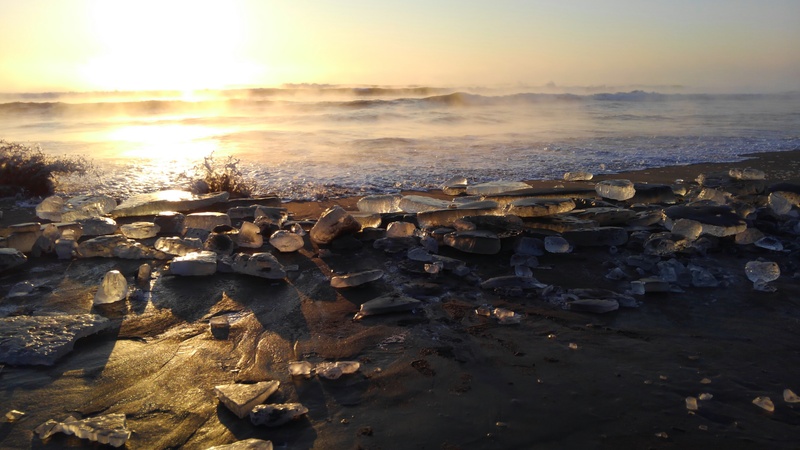 Some of it was dirty and covered in sand, but when the tide flowed in, it washed the ice, caressed it to a polish, and deposited it in a new place to wait for the next waves. one more diamond tempted him. He lost track of time, of all the other tourists, and in fact, of his bride who was off on her own search. He’d walked about 50 meters down the beach, where there were only three or four lone photographers, concentrating on their own little patch of beach, and he was in a world of his own, until he’d heard the shouts. He turned back and looked at the mass of tourists near entrance. They were pointing out to sea, and then he saw her red parka, bobbing on the waves. He froze for an instant. The voices in his head were louder than the surf. Whatthehell, callforhelp, idontspeakthelanguage, imgoingtodieinthefrozensea. He stuffed the doubts away. This was Dahlia, for better or for worse. He hoped someone in the crowd would call an ambulance. He kicked off his shoes and ran into surf, trying to keep the red parka in sight. Author’s note: This is the second in my local settings posts. I took these pictures this morning at Toyokoro, which exploded into fame last February for its jewelry ice. 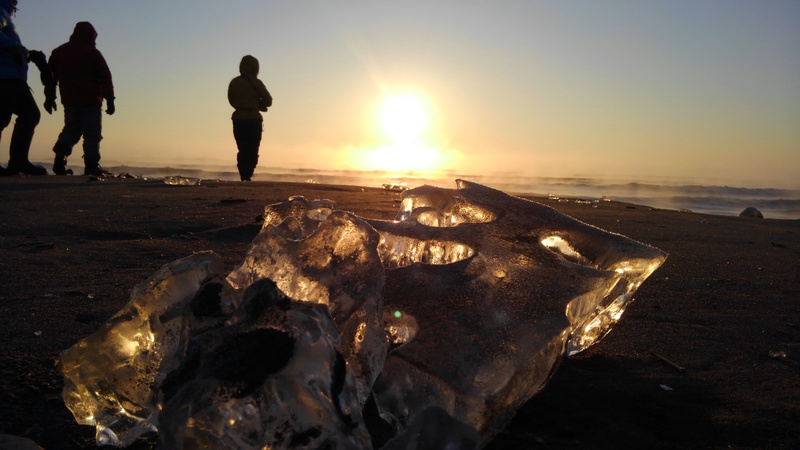 Actually, the ice has been forming there for centuries, but Mr. Hisashi Urashima, a local photographer with a gift for tourism marketing, popularized the name, “jewelry ice“. His photos are well worth a look. Urashima’s father, Kouichi, was responsible for turning a photogenic elm tree into a tourist destination. The legend around town is that he took pictures of the elm tree every single day, and some of his photos were used at the end of a TV drama. The tree’s fame spread, and attracted many tourists to the tiny town of three thousand people. It’s inspiring: hone your craft, share your art. Who knows what will happen? Visiting the beach this morning (enduring -15C temperatures but enjoying the bright sun), this fictional couple sprang to my mind. (-: Thank goodness, nobody fell into the ocean in real life! What inspires you in your neighborhood? This entry was posted in Setting, short fiction and tagged E.M. Duskova, Geoff and Dahlia, Hisashi Urashima, ice paradise, Kouichi Urashima, Michaeline Duskova, settings to inspire fiction, short fiction, Tokachi settings, Toyokoro jewelry ice, winter stories. Bookmark the permalink. The ice jewels are amazing. No wonder they inspired you. My biggest local source of inspiration is Charleston Falls, a little nature preserve about 5 miles from my house. I was there with the dog yesterday and the falls were frozen (you can see a picture on Instragram or FB), and in the spring the park gets waves of wildflowers. The park has both a wooded area and a prairie, and glides smoothly from early spring–Dutchman’s breeches and hepatica and bluebells and trillium–into summer–milkweed and chicory and a dozen kinds of sunflowers. And I try to show up faithfully every Saturday morning and snap pictures. Have you/do you think you’ll do anything with flower fantasy in your writing? I’m kind of working my way out of a slump with winter magic. The ice jewels are natural, and so were the beautiful trees frosted with “diamond dust” (fog from the river at night crystallizes on EVERYTHING when conditions are right). (-: Summer magic, I feel I’ve got a handle on! But maybe I’ll have to pay extra special attention this spring. It really pays to repeat, repeat, repeat. The Urashimas took regular pictures, and in fact, I ran into H. Urashima this morning when I went again with my daughter. My kid and I had so much fun! The light was somehow different — we got there earlier, for starters and she caught the sunrise while I was parking the car. Yesterday, I just took pictures of what I found — compositions of luck and other people. Today, we did that, but we also had fun taking some of the sandy ice that had washed up to the top of the shore, and throwing it back in the tide to be washed and re-arranged. I think I’d like to do this every year. It’s a very enjoyable way to get in a morning walk! And it’s so fleeting — next weekend, we’re doing other things, the weekend after that will be all about man-made ice in at Obihiro’s Ice Festival, and I think the next weekend might be trying to capture more pictures of the swans in Otofuke (I posted some old pics last week of the swans here https://eightladieswriting.com/2018/01/13/michaeline-exploring-your-setting/). We drove by this morning, and the river is mostly frozen. There was a hardy gang of about two dozen birds gathered around the food-bearing tourists, but it was rather sad. At any rate, getting up at 5 a.m. or earlier to catch the dawn on the beach is probably out of the question for this year. But, gosh, I’m glad I did it this weekend! Flower fantasy in my writing. I’ve thought a little about featuring a botanist in on of my small town contemporary romances. We’ll see how that goes…. (-: Botanists make good characters, IMvery humbleO, LOL. There used to be quite a few floating around about 15 or 20 years ago. Brother Cadfael was a medieval botanist/herbalist, and then there was Susan Wittig Albert’s herbalist in those mysteries set in Texas, I think it was. Ah, yes, Google tells me it was the China Bayles series. I loved those! I’ll have to look for the Wittig books. Right now, my Russet Springs series has one book that’s a not-quite-finished second draft. Considerably better than the first draft, but still a mess. I’m itching to get back and finish it, but I need to stay on task to have any shot of putting 3 paranormals out this year.